We have a summary of the Sierra de la Laguna in a previous post here. After doing a little internet research and asking around for current directions to La Burrera and how to find the trail up to the namesake meadow in the Sierra de la Laguna, we drove up to the trailhead, had an early dinner and woke up at 4:30 to start hiking to (try to) beat the heat. Around 6:15, while at only 460 meters elevation (adjacent to Rancho La Rueda and it’s palapa restaurant, directions below), we heard a Cape Pygmy-Owl tooting in the wash we were walking alongside. About 30 minutes of chase ensued and we were rewarded with great views of a pair of Cape Pygmy-Owls in the early dawn light. All sources we have found indicate that they are breeding up in the pine-oak forests in the Sierra de la Laguna from about 1500 meters up, and that they range down to about 500 meters in the winter. It is hard to say if these guys were done breeding early or if that information is not completely correct, as we saw two and then a bit later heard a third Cape Pygmy Owl below 500m in mid-July. 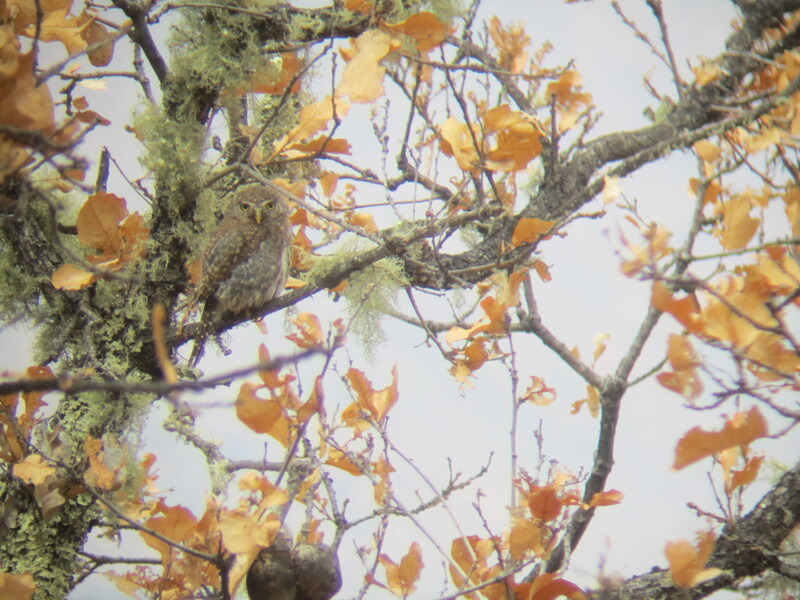 Cape (Northern) Pygmy-Owl. Photo taken with a hand-held camera through binoculars. In any case, the hike up was a bit brutal in July (as was the hike down) but the reward was terrific. Buried up in the mountains amid the arid landscape of southern Baja is a verdant pine oak forest with a huge meadow in the midst of it, year round water, and a host of endemic birds. We found the San Lucas Robin, the Baird’s Junco and the local forms of the Cassin’s Vireo and the Acorn Woodpecker to be quite common and conspicuous throughout the plateau and meadow area, and we saw an additional two Cape Pygmy Owls up there. Apparently Western Screech-Owl and Mexican Whip-poor-will can be found up there as well but we did not hear or see either. We also heard at least 15, probably closer to 25, Pacific-Slope Flycatchers singing up there. While they are not listed as breeders for southern Baja in some sources, Pacific-Slope Flycatchers are local breeders in the Sierra de la Laguna. The turnoff to La Burrera is not signed currently. Coming south from the south edge of Todos Santos it is a bit over 1 mile, perhaps right around 2km, to the turnoff. The turnoff is just south of the KM54 marker, which is missing in the southbound direction but present on the northbound side of the road, you can watch for the appropriate size sign and read it over your shoulder. Just after the KM54 marker, you will have a small rise in front of you. At the crest of the rise are a pair of stone pillars with a gate between them on the right (west) side of the road. Immediately opposite these gates on the left (east) side of the road is a turnoff onto the dirt road to La Burrera. Turn onto this dirt road. After about ½ mile you will come to construction where they are putting through a new road, apparently Hwy 19 will be a divided Hwy in this area? You’ll need to negotiate your way through the construction so you can continue straight on the road you were on. At a bit over 2 miles you come to a fork, go right, slightly uphill towards an old tower. At about 4 miles is another turn, this time signed for the Reserva de la Biosfera Sierra de la Laguna, go left here. At about 5.5 miles and about 7.5 miles you drive through fences/gates. There is a minor fork to the right at 8 miles that you ignore, continue on the main road. At about 9 miles there are turns to the left and the right, ignore them and continue straight (the main road to the trailhead is fairly obvious – stay on the main road). At about 12.5 miles you arrive at a locked gate with a larger Reserva de la Biosfera Sierra de la Laguna sign, an outhouse, and a little hut. There may or may not be someone to collect a small fee and issue you a wrist band, depending on season, in the hut, so it’s better to get your wrist band at the CONANP office in Todos Santos ahead of time. Despite talking to several people in Todos Santos for directions we didn’t know we needed to obtain permits/wrist bands and instead paid a CONANP worker we met on the trail. We camped at the trailhead in our vehicle and started the hike early the following morning. Cross the locked gate. The graded dirt road descends a short ways then levels out. Shortly after it levels out, after perhaps 10 mins hiking, you will come to a fork, keep left on the larger road. Shortly thereafter a road comes back in from the right, ignore it. After another 10 mins or so you will come to another fork, at this fork both roads seem equally travelled, but you want to go right. After a slightly longer stretch, perhaps another 20 mins hiking, you come to one more fork, with a lesser road heading right. You want to go left. Again all these forks should be signed for “Sierra de la Laguna.” The next thing you’ll reach along the trail is a simple palapa restaurant signed “Restaurant La Rueda” that is open in the busy winter season for light meals and cold drinks after hiking. The trail at this point is just coming down into the wash. Follow the trail past the restaurant and around left through a fence into the near side of the wash. After another 10 minutes or so hiking you’ll come to a sizeable clearing on the right, then a crest in the road. Once down the other side of the crest there is a signed left turn for “Sierra de la Laguna” where the trail leaves the road. There is another green gate about 100 yards past the turn off of the trail which would stop you in case you miss it. Once on the trail it is heavily used by humans and horses and extremely easy to follow. At times the trail is eroded so thoroughly that the trail is 10’ below ground level! In total it’s about 3.5 km (a bit over 2 miles) and mostly very flat from the parking area to the actual beginning of the trail. Then it is about 8 km (5 miles) of very steep, hot and dusty trail up to the crest of the mountains. You gain about 1300-1400 meters (perhaps 4500 feet) of elevation in these 8 km. From the crest it is about 3km (2 miles) further to the large meadow, passing the first meadow on the way. There are a couple of minor trails that leave the main trail, easy to figure out where to go, and there is a bit of a trail junction in the first meadow. If the signs are missing, when you arrive in the first meadow you want to continue straight along the right edge of the meadow and leave the meadow heading back into the woods and slightly uphill from the far right corner of the meadow as it appears to you. It should be signed for “Segundo Valle.” Once in the second meadow the first thing you reach is the forest workers camp where you can get water (piped over from the spring). They seemed to prefer that we get water there rather than walk over to the spring. There is a signed camping area a bit further along past a second set of cabins / buildings where there are flat areas under the trees and some fire rings. We also ran across the owner of the Restaurant La Rueda, and the ranch of the same name that is adjacent. His name is Porfidio Diaz. He operates a couple of simple cabins where you can stay, and if you contact him a couple days ahead of time he can let you through the gate and you can stay at his ranch, saving you a couple kms walk in each direction. We didn’t ask what he charges for the cabins, but his phone numbers are: 620-147-5718 and 620-348-0224. He said to be sure to contact him a few days ahead of time so that he can get the message and get back to you. Hi, did you need four-wheel drive or high clearance to get to the La Burrera trailhead? We have a VW golf, which are notoriously low clearance. Any concerns about this? Thanks! When we were there, the roads were in great shape, you should be able to readily get there in a Golf. Even if the road has gotten a bit worse, it should still be passable. It was the kind of road we could drive our truck 50mph on if we wanted to, flat and wide open with just some washboard. At the very very end and around the parking area it is a bit more uneven but still no problem for a car. Great, thank you so much for the information– that eases my mind! Really looking forward to the trip into the mountains! Hello! Is anyone in Mexico near this trail around to reply to me? if anyone who reads this knows anyone who lives near there please email, call and alert them. The couple who gave Max a ride to the trailhead have not been found. We don’t know who they are or where they are or IF foul play was involved. But Google “Max Watson”…and you can read more…there is also a Facebook page called “Bring Max Watson Home!! !”…Please join it and read more….Thank you for any information or help you can give the family and search parties.. The file includes a track following the whole trail from El Porton to the camping sites in Second Valley. It also includes some waypoints, including the locations of water (one site near Mile 4, and one site in Second Valley), and the locations of El Porton, La Rueda, La Ventana, the highest point, and the First and Second Valleys. I’ve also marked a waypoint along the trail every half mile from Mile 2 to the end. Using this file in combination with your GPS, or simply by loading it into Google Earth to examine it before your trip, should take a lot of the guess work out of your trip planning. Permitting Update: after much ado, we figured out that the permitting is quite simple. While there is a CONANP office in Todos Santos (they gave us a nice map of the trail system, and small booklet about the park), they directed us to the Todos Santos Surf Shop, where the permit bracelets are sold. As of Jan 2019, each person needs to pay 800 pesos per trip to access the privately-owned ranch land, plus 17 pesos per day (might be more for non-Mexicans) to access the National Park. They will give you a list of rules when you purchase the bracelets. Road update: we drove the road in a crappy rental car, and we made it. It took 2 hours to go 20 km. The road was really really bad in my opinion. For most of the route, the road is sandy with a tall berm between the two wheel ruts, leading to a real risk of bottoming out. In other places, the road is like a washboard and the vibrations were horrible if we went more than 10 km/h. And in a few places, the road is washed out enough that we needed to stop and be strategic about where to put each wheel. I would HIGHLY recommend a higher clearance vehicle (with which the road could be done in 40 minutes, probably). Birding update: I guess there are no wintertime trip reports, but eBird bar charts suggested that all the targets would still be possible. We found the Baird’s Junco and Acorn (Narrow-fronted) Woodpecker to be reasonable common and conspicuous. The sierra race of Cassin’s Vireo and the Cape Pygmy Owl were not detected at all during our three days on the trail. The San Lucas Robin was seen, barely: two individuals moved silently at the tops of the pines one time, and never did provide nice unobstructed views. That was just downhill from the highest point (on the La Ventana side). All in all, the trail was VERY easy to follow, and quite scenic. On the way out, near a Rueda, we met Sr. Diaz and his family. Diaz gave us his updated phone number (612-228-1485) and asked that people contact him using WhatsApp.